Often I see questions about setting up PPP on irix on the comp.sys.sgi. * newsgroups. Usually these are caused by the number of fairly cryptic files that need to be changed in order to set up PPP on Irix. This program is an attempt on my part to simplify the process by providing a small GUI driven utility to make most of the changes for you. 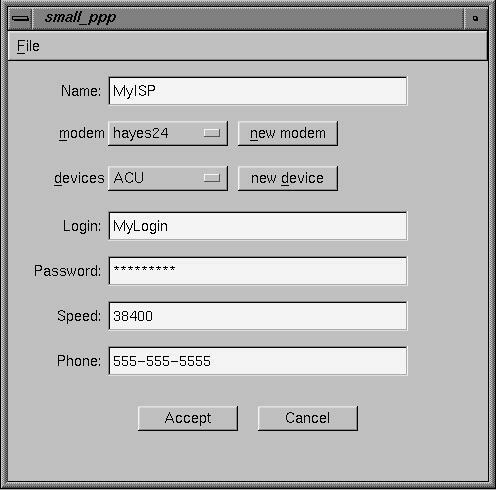 This is the main screen for the Small PPP program. The first field (Name) should be a unique name you have given your ISP. It cannot contain any spaces or other non-alphanum characters. The second field (modem) reads your /etc/uucp/Dialers file and allows you to select any of the modems listed in there. For many people the hayes modems will do. The new modem button allows you to add a new modem to the /etc/uucp/Dialers file. Do not use this feature unless you are acquainted with modem initialization string. It does not provide you will any real help towards building modem initialization strings. I did provide as the default string the one I use to initialize my hayes modem. 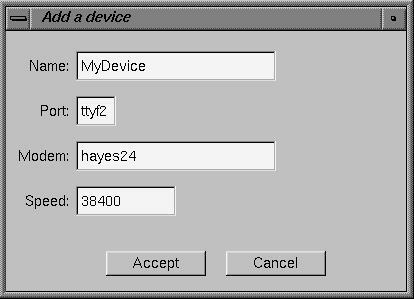 The third field (device) allows you to select the device to use from the /etc/uucp/Devices file. Here the ACU device is recommended. But the user should check to make sure that the ACU device is connected to the correct port (often ttyf1 or ttyf2). If it is not, the user should either edit the /etc/uucp/Devices file to ensure that it is, or use the new device button to build a new device, which will be added to the /etc/uucp/Devices file. Here the user is prompted for the new device name, the port, the modem to use and the speed of the port. The speed listed here should match the speed listed on the main interface screen (usually 38400). The rest of the fields are pretty self explanatory. You must enter your login name, password, and the telephone number you wish to dial to reach your ISP. These should be provided to you by your ISP. The only file that may need to be altered (that I know of) that I have not provided for, is the /etc/resolv.conf. Here your ISP's name server should be listed. Some ISPs actually pass the nameserver address as part of the PPP initialization. Thus I did not include that as part of the this program. Small PPP is provided as a binary only, was compiled using the FLTK toolkit on Irix 6.2. It carries no warranty or any other such stuff. It does change system files and thus must be used from the root account. Use with care. It is possible to create illegal / non-functional entries in these files.